The revised Renewable Energy Directive (RED II) includes fuels which are produced from waste streams of non-renewable origin, also known as “recycled carbon fuels”. This means that fuels derived from non-renewable wastes such as plastic, rubber, gaseous wastes etc., could be promoted through transport targets and support schemes. This briefing by Zero Waste Europe and Bellona Europa highlights the key concerns regarding these fuels. 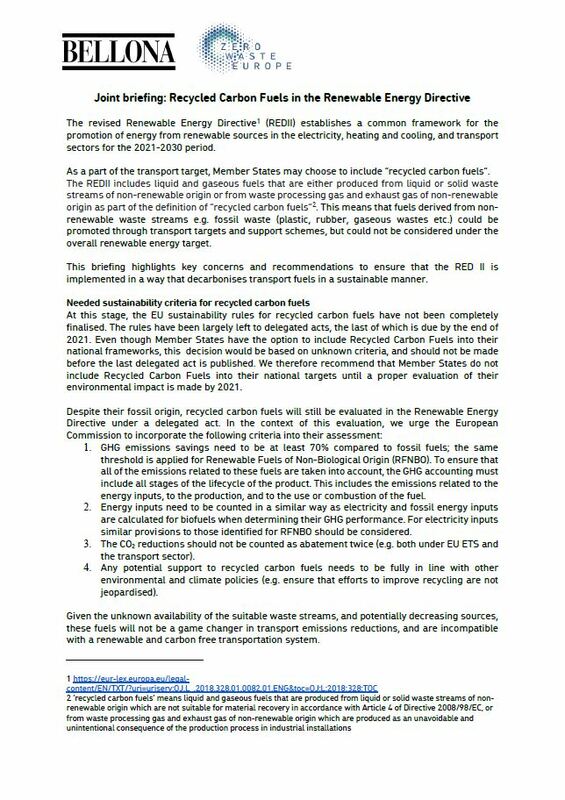 In addition, the briefing provides recommendations which ensure that the RED II is implemented in a way that decarbonises transport fuels in a sustainable manner, rather than threatening climate and recycling targets. The revised Renewable Energy Directive (RED II) includes fuels which are produced from waste streams of non-renewable origin, also known as “recycled carbon fuels”. This means that fuels derived from non-renewable wastes such as plastic, rubber, gaseous wastes etc., could be promoted through transport targets and support schemes. In the briefing, Zero Waste Europe and Bellona call on the European Commission to develop a set of robust environmental criteria that ensure the impacts of these fuels are accounted for properly and on member states to refrain from endorsing these fuels before those criteria are put in place.